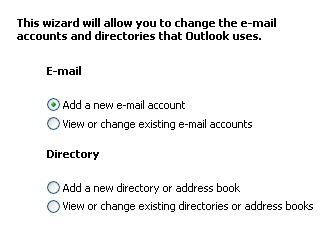 This guide will show step-by-step instructions for setting up E-mail on Outlook 2003 for Windows. 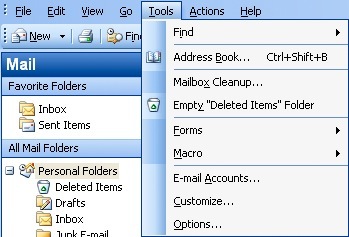 While it can be used for other versions of Outlook, some screens and steps might vary. Click on the "Add a new E-mail account" option. You will be presented with the E-mail Accounts window. Please enter your mail server. This can be found in the E-mail Accounts section of the cPanel under Configure Mail Client. It will be something like mail.yourdomain.com. The Outgoing Mail Server is the same as your incoming mail server. Again, this will be something like mail.yourdomain.com. You will be presented with a pop-up window with advanced settings. If you are using POP3 with SSL, please click the checkbox and select 995 for your port. Otherwise leave the port at 110. 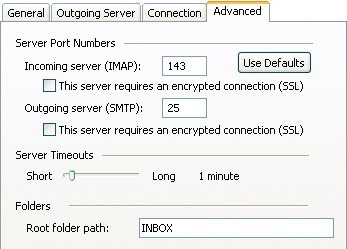 If you are using IMAP with SSL, please click the checkbox and select 993 for your port. Otherwise leave the port at 143. 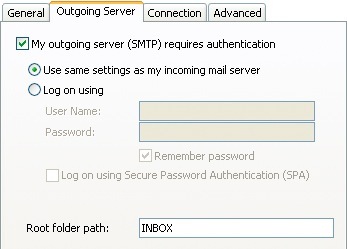 If you are using SMTP with SSL, please click the checkbox and select 465 for your port. Otherwise change the port to 26. You should now be able to send and receive mail.